What goes from zero to 60 in 4 sec., tops out at more than 130 m.p.h. and appears to be missing a gas tank? 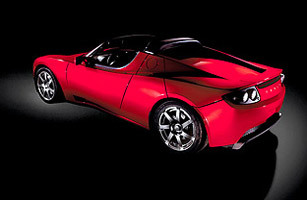 The Tesla Roadster 100. It's pure California: a hot sports car that doubles as a statement against pollution and oil dependence. Its massive lithium-ion-battery array can power it for up to 250 miles of highway travel, and even though it will fatten your electricity bill, the Roadster is still twice as efficient as a Toyota Prius.